Winter is coming, and there’s no better way to keep yourself warm than with a delicious cocktail in a cosy, friendly joint. 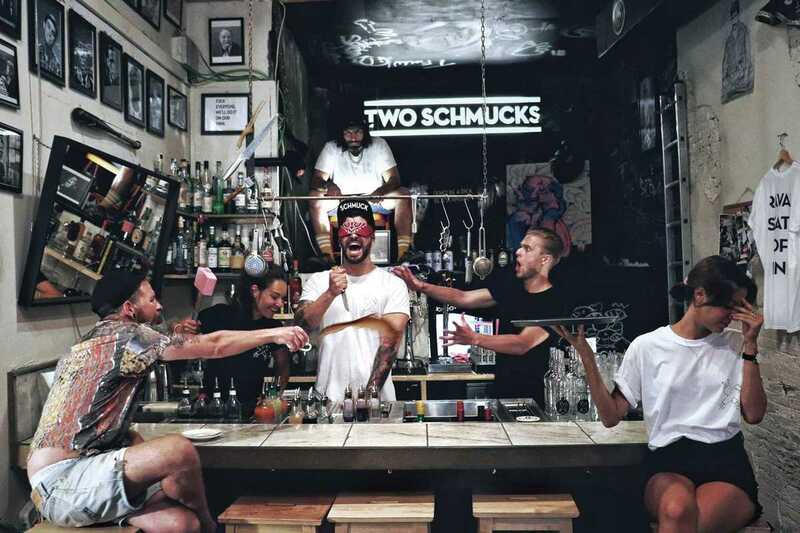 Moe Aljaff and AJ White are the “schmucks” of the Two Schmucks bar – although we’d argue they are anything but! This “five-star dive bar” is the result of Moe and AJ’s dedication and love for cocktail shaking, earning them a place in the Top 4 Best New International Cocktail Bars at the Spirited Awards in 2018. These schmucks worked the first six months of the bar’s opening themselves, on 12-hour shifts a day for six days a week, and not taking a penny of the profits. And by Jove, did it pay off. Catering to the locals while providing exceptional service, this isn’t your average cocktail bar – it’s a vibrant, cheerful reflection of the cool, ramshackle and alternative vibe that seeps through the pores of Raval. They offer coffee, tea, soft drinks, apéritifs and cakes during the day, and cocktails, beer, food and a fair share of banter at night.